Mitsubishi MELFA range of advanced MELFA robots offer speed, accuracy and compact design as well as long life as well as delivering class leading benefits for small-medium robot applications. Producing a comprehensive range of robot models to cater to the full spectrum of modern needs, all Mitsubishi Electric robots are powerful, fast and compact. The product range includes the almost universal articulated-arm robots with 6 degrees of freedom and payloads of 2 kg to 20 kg and SCARA robots with 4 degrees of freedom and payloads of 3 kg to 70 kg for assembly and palletising tasks. There are 2 special high-precision robots that are unique, with their parallel arm structure for very fast micro handling tasks with payloads of 1 kg to 5 kg as well as the flexible high-speed SCARA robot for ceiling mounting. It is no longer enough for industrial robots to simply perform a single task with consumer needs evolving quicker than ever. Demands for robots with the capacity and flexibility to readily take on more sophisticated tasks is what the industry is now demanding. If you are looking for intelligent solutions and a simpler approach to flexible and advanced production then the MELFA-FR Series provides this. MELFA SafePlus features safe and collaborative work applications and allows robots and people to work together providing high speed and performance and high levels of safety. FA-IT Integration Functions alongside Mitsubishi Automation products provide high levels of functionality performance and ease of use which in turn supports next generation manufacturing. The RV-series offers a highly-dynamic 6-axle articulated robot for a high degree of quality. Cycle times of only 0.32 seconds increase their productivity and thus enable their use in systems at very high speeds. The double-arm structure not only provides a plus in terms of freedom of movement, but also more stability and versatility. Depending on the model, the robots are fitted with two to 70 kilograms load at ranges from 504 to 2055 millimeters. Work in very confined spaces,even with wall or ceiling installation, is no problem for the RV-series. All systems up to 20 kg have the same compact robot controller . In addition, all systems are fitted from the factory with built-in Ethernet, USB, tracking, camera and additional axle connections, as well as manual inputs/outputs, and therefore run with an availability of over 99.9 %. Flexible workspace: Range 504 to 2055 mm with spherical workspace – also behind the robot. Connectors: Pneumatic and electrical grippers, Ethernet, USB, camera interface and two encoder connections and up to 8 additional external axles as standard, optional I/O and field bus expansion cards. Direct Connection via Ethernet to GOT HMI and teaching box. The RV-FR series offers 3 additional features: “Next-generation intelligent functions”, “Safe, collaborative work applications”, and “FA-IT integration functions”. The RH Series, which in SCARA class provides excellence in 0.29 seconds, with fast palletizing and targeted re-sort. The product range includes the entry-level model RH-3F(R)H to work with up to 3 kg, the power pack RH-6F(R)H with a maximum of 6 kg load capacity, the RH-12F(R)H with 12 kg load capacity and the top model RH-20F(R)H with 20 kilograms load capacity and a range of up to 1000 mm. 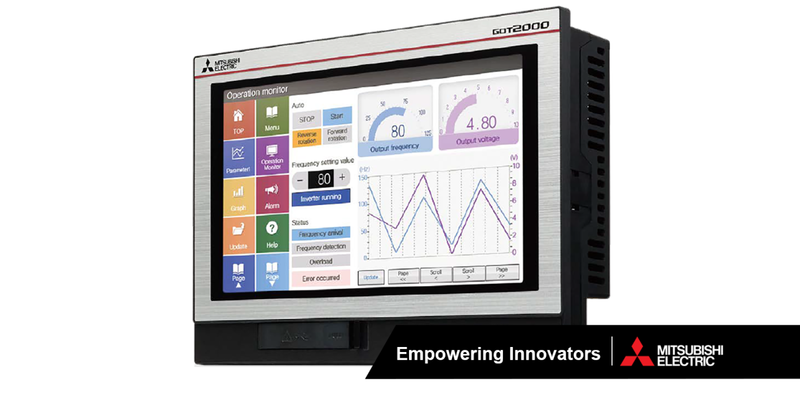 All variants are available as a complete system or as an easy to integrate module for full PLC-functionality of the robot on the Mitsubishi Electric iQ platform. Due to the drastic extension of its swivelling range, the robot easily achieves any position within its workspace. This is due to the extremely low cycle times of the RH Series which in turn provides exceptional flexibility. Connectors: Pneumatic and electrical grippers, Ethernet, USB, camera interface and two encoder connections as well as up to 8 additional external axles, optional I/O and field bus expansion cards. Direct Connection: via Ethernet to the ASAT-operating terminals. The RH-FR series offers 3 additional features: “Next-generation intelligent functions”, “Safe, collaborative work applications”, and “FA-IT integration functions”. 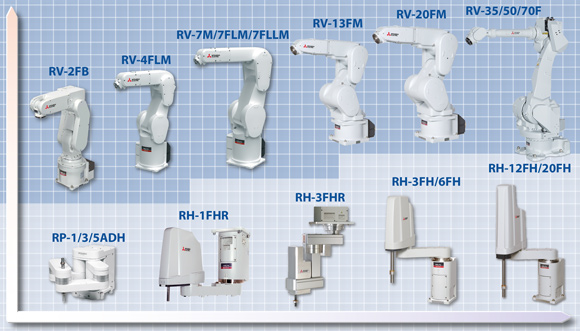 Having a special compact design and support for overhead installation above the application, the robots RH‑1F(R)HR and RH‑3F(R)HR do not take up any valuable space in the work area next to the installation location. This enables even smaller work cell dimensions. For high-speed handling of small parts up to 1kg, the RH‑1F(R)HR is the perfect robot. It allows up to 150picks/min. with conveyer tracking including hand open/close. The RH‑3F(R)HR robot’s perfectly circular cylindrical work space is 150 mm high with a diameter of 700 mm. It can access any point in this space while manipulating a payload up to 3kg. Closed arm housing: Internal vacuum valve and internally routed cables present any snagging with peripheral equipment. The RH-FRHR series offers 3 additional features: “Next-generation intelligent functions”, “Safe, collaborative work applications”, and “FA-IT integration functions”. The RP-series of Mitsubishi Electric convinces due to its innovative concept, which is required for highly accurate and extremely fast applications. The robots have a unique double-arm structure which significantly increases production and improves quality within micro-handling. Together with the ultra-compact SD-controller, the RP-robot can be manually installed in any application, no matter how small. Like all MELFA-robots, the RP-series is already fitted at the factory with all features such as Ethernet, USB, tracking connection and the additional axle control for up to 8 additional axles. Weight: 1 kg to 5 kg handling weight for many different applications. Connectors: Pneumatic grippers, Ethernet, USB, camera interface and two encoder connections as well as up to 8 additional external axles as standard, optional I/O and field bus expansion cards. Direct Connection via Ethernet to GOT HMI and teaching box. For any further information, please get in touch. New Technical Tip on GOT2000 Alarms using GT Designer 3. This is a great technical tip for creating your HMI projects in more detail.